Hall-of-Famer, Wayne Gretzky, once stated that great hockey players do not skate to where the puck is but to where the puck is going. With Gretzky’s maxim in mind, we found it interesting to learn that Antoine Van Agtmael, who coined the term emerging markets over 30 years ago, offered some provocative thoughts1 which suggest where the investment “puck” is currently headed. Van Agtmael’s comments are notable for his professional “franchise”, which includes his popular 2007 book, The Emerging Markets Century. The book revolves around the thesis that competitive advantages, particularly in the manufacturing realm, favor economic and investment opportunities in emerging markets at the expense of the U.S. And, as the term century suggests, he expected that these trends would favor emerging markets for quite a long time yet. But economic dynamism has caused Van Agtmael to reconsider. What he calls the creative response to emerging markets competition from U.S.-based manufacturing has been much more rapid and profound than anticipated. He notes that Hyundai has state-of-the-art car plants in numerous locations throughout the world. Yet it is their U.S. plant that registers the highest unit-per-hour production. He also highlights General Electric comments that even in relatively “lower-tech” manufacturing functions, an American factory worker at $15 per hour has become competitive with a $3 per hour worker in emerging markets when productivity and transportation costs are fully considered. In addition, Van Agtmael frets that demographic conditions in China are shifting from economic tailwinds to headwinds. China will experience a declining working age population by 2018 if not sooner. Similar demographic conditions in other countries have proved difficult to overcome from an economic growth perspective. China’s demographics only add to the over-investment, excessive debt, pollution and corruption challenges now facing their economy. Chemical makers from Germany’s BASF to Brazil’s Braskem plan to invest as much as $72 billion in U.S. plants, as they become increasingly convinced natural gas will remain cheap and abundant. Meanwhile in the U.S., the evolution of high-tech productivity enhancement tools like robotics, 3-D printing, simulation software, the “industrial internet of things”, and advancements in material sciences are turning manufacturing into what Agtmael terms brainfacturing. Along these same lines, he sees the area once known as the U.S. rust-belt morphing into a manufacturing brain-belt. These latter comments certainly are suggestive of an investment puck in motion. It is careening away from trends favoring emerging markets and is establishing new investment trends that favor both the U.S. as well as companies involved in the U.S. manufacturing renaissance. Our company-focused, ear-to-the-ground investment approach turned us onto to this divergent trend some time back. Over the next few years, we believe the trends driving the rise in Van Agtmael’s brainfacturing will become much more widely recognized by investors. As we have discussed on prior occasions, those businesses that can create and deliver the “tools” of today that enable other companies to become more productive should find fertile growth markets. The economic environment is ripe to become more hospitable for accelerated business investment in productivity enhancement tools. Yes, fear, uncertainty, and doubt remain very high in the aftermath of the Financial Panic of 2008 and Washington D.C.’s wet blanket regulatory and corporate tax policies. Now, facing both the normalization of Federal Reserve policy and (higher) interest rates, the economy will once again need to demonstrate its resilience. Why can one have confidence the economy can withstand this change in monetary and interest rate policy? The Fed is normalizing policy as evidence continues to accumulate that the economy no longer needs extraordinary measures. Just as Van Agtmael has come to recognize that economic dynamism beneath the surface of things has sent the investment puck in motion, so too have evolving conditions underlying the domestic economy changed—and changed for the better. 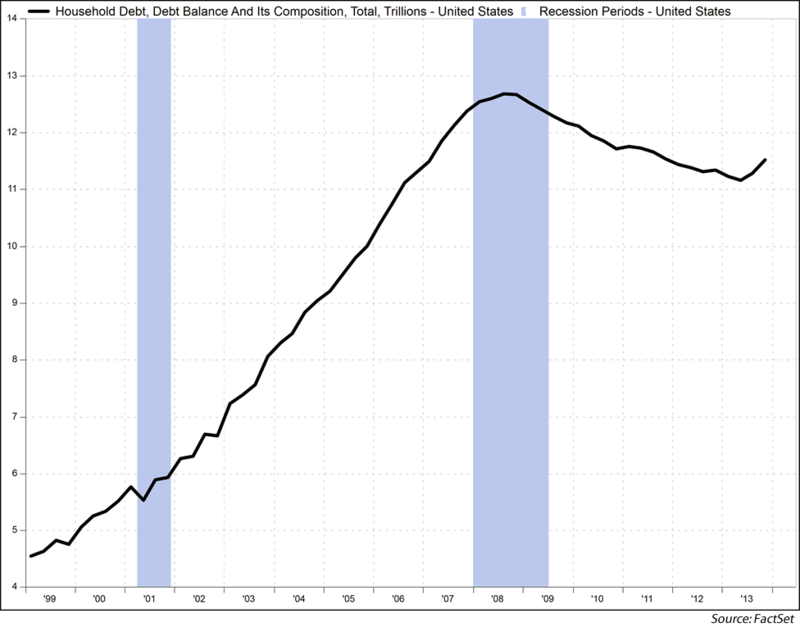 With private credit demands stirring (see Chart 1), it is no longer necessary for the Fed to step in and cushion the impact of a “de-leveraging” economy. Even as the Fed shifts away from the extraordinary actions of the past few years, it is important to consider that its policies will remain pro-growth. Fed policy and interest rate normalization should not, therefore, prove to be threats to the economic expansion for some time yet. Business cycle history indicates that unsustainable excesses typically accumulate as an economic expansion progresses. Economic momentum that is powered by excesses—housing in the last business cycle for instance—is low quality in that it is unsustainable and prone to “bust”. Typically, excesses can be traced to debt and inflation. The present expansion so far reflects little in the way of accumulated excesses in these areas. Consider: inflation remains low enough that many still worry deflation is a real threat, the banking system is better capitalized than it has been in decades, corporate balance sheets are extremely liquid, and consumer debt loads do not appear burdensome (Chart 2). As China emerged economically, it also became the price setter for almost all commodities around the world. China’s growth going forward is apt to be much less commodity intensive; cyclically, as it battles its own accumulated excesses from past growth and structurally, as it attempts to transition from investment/infrastructure-led growth to consumption-centric growth. Slower, less commodity-intensive growth in China renders the so-called commodity super cycle more “where the investment puck was”, rather than where it is headed. China’s chief auditor discovered $1.52 billion of loans backed by falsified gold transactions. And, public security authorities are probing alleged fraud at Qingdao Port, where copper and aluminum stockpiles may have been pledged multiple times as collateral for loans. Steps by the Chinese government to rein in credit by raising borrowing costs in recent years created a surge in commodities financing deals. Commodity price relief is a positive factor for U.S. consumer spending. It also has very favorable implications for U.S.-based business investment spending as planning time horizons tend to extend when input costs are less uncertain. From an investment perspective, it is also notable that large investors appear mostly positioned for where the investment puck “was” (Chart 3), and such behavior is rarely associated with either a top in the economy or the stock market. In addition, even a modest shift in their strategies could have a favorable impact for brainfacturing investments and U.S.-traded stocks in general. ”“Corporate pension funds and university endowments in the U.S. have missed out on much of the rally for U.S. stocks since 2009, following a push to diversify into other investments (commodities and so-called alternative investments) that have had disappointing performances. 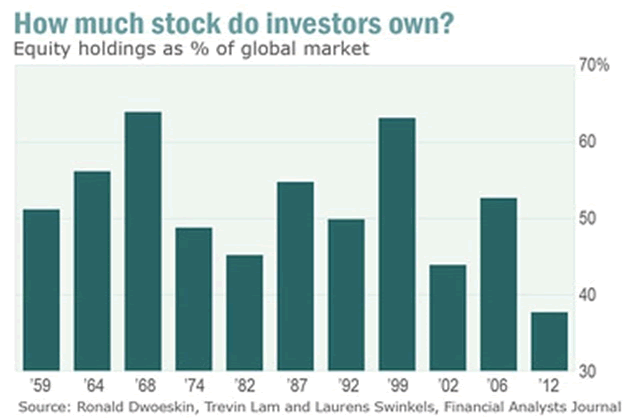 Chart 3: Large investors well positioned for where the investment puck used to be? Confidence rises as an economic expansion demonstrates resiliency. In turn, consumers, investors and businesses slowly shed the extreme risk-aversion strategies adopted during hard times. Consumers begin making deferred purchases. Investors begin to think in terms of reward potential instead of fixating only on possible risks. Business priorities shift from “survive the economic calamity” mode to “do what it takes to prosper” mode (see Henry Ford quote below). This all results in increased economic activity, which triggers still more economic resiliency and confidence. Although the current business expansion is 5+ years old, troubling excesses are largely absent, and it is still quite immature in the self-reinforcing aspects just discussed. 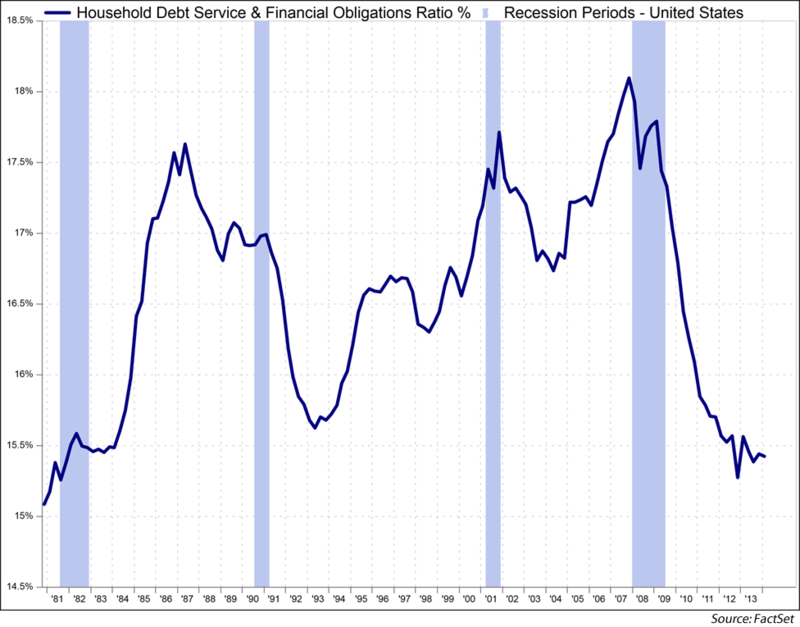 The next recession will, indeed, occur at some point, but it is likely some way off yet. If you need a machine and don’t buy it, then you will ultimately find that you have paid for it (via a weaker competitive position) and still don’t have it. Lazar also offers the observation that since the recession bottom in employment, manufacturing has registered its strongest employment growth for any period in the past 30 years. It has been a long time since the manufacturing multiplier has worked in the “right” direction for the domestic economy! The final factor we will discuss that is driving the investment puck relates back once again to that all-important, but easily to overlook, notion of economic dynamism. Dynamism’s impact on the economy goes well beyond a manufacturing renaissance. A vivid example is provided in Greg Zuckerman’s book The Frackers.3 Zuckerman takes readers back just a few short years ago when many pundits were preaching a gospel of “peak oil”, and Exxon and nearly every other major oil company were focused on exploring for new supplies in distant regions of the globe. Meanwhile, a group of “wildcatters” were combining horizontal drilling with hydraulic fracturing to defy the experts and unleash an energy revolution. This included incidentally, drilling and finding pay-dirt literally beneath Exxon’s own Texas headquarters. At its most basic level, economic growth is largely about information. The information is attained as new idea recipes are created and refined as innovations through constant experimentation, and typically funded by intrepid investment. And today’s emerging ability to share information, to tap it, and blend it with ideas of one’s own in new recipes of innovation is unprecedented. ”“The technology revolution has put the means of production within everyone’s grasp. It comes in the form of the smartphone, the tablet, and the PC with broadband internet connection. (As) billions have access to the necessary tools to participate in the global economy, it is hard to believe the result will be anything other than the widespread unleashing of creativity, productivity and human potential. The connectivity revolution is potentially another leg to industrial revolution in the sense that it has the potential to create another prolonged period of productivity miracles. Granted, economic dynamism focuses on mankind’s ability to create favorable outcomes. History is obviously also sadly stained by those who created unfavorable events through aggression and destruction. Iran, Iraq, Russia, North Korea, Syria, etc.–lots of potential areas exist that could unleash new chapters of serious trouble. The probability for geopolitical trouble is, therefore, not insignificant. But, of course, this has been the case since the 9/11 attacks. Unless and until such probabilities take a turn for the worse, the greatest probability is the investment puck remains in motion on its current brain-belt/brainfacturing path. Investment opportunities on this path beckon. Small business (1-49 employees) employment has been setting all-time new high records since last year with nearly 50 million employed. Large businesses (500+ employees) are still nearly 1 million below record peak employment (2006) at 27 million employed. U.S. high school graduation rate is at a record (80%). High school unemployment has declined from 11% to nearly 6%. According to a new survey from the National Association of Colleges and Employers, companies planned to hire 9% more graduates from the class of 2014 than last year, versus just 2% in 2013. Bachelor’s degrees are most in demand. The North Dakota Bakken shale boom is now expected to continue through about 2039, a decade longer than predicted just last year. In Europe some are joking that London has become one of the largest French cities. Some polls indicate 50% of young adults wish to leave France. Federal government outlays have been flat for the past five years and even declined over the past year. The number of workers on the Federal payroll is at a 50-year low. 1 Authers, John, “U.S. Revival Warrants Emerging Markets Strategy Rethink”, Financial Times, 16 May 2014. See also “The End of the Asian Miracle”, Foreign Policy Magazine, 11 June 2012. 2 “The End of the Asian Miracle”, Foreign Policy Magazine, 11 June 2012. 3 Zuckerman, Gregory, “The Frackers: The Outrageous Inside Story of the New Billionaire Wildcatters”, October 2013. 4 Andreessen, Marc, “Tech Revolution Has Put Means of Production Within Everyone’s Grasp”, Financial Times, 24 June 2014.